PENSACOLA, Fla. - July 15, 2014 - PRLog -- Enzar Empire Press (an imprint of Energion Publications) is pleased to announce the release of Day of the Dragon, an epic tale of speculative science. This new novel will be available through major online retailers, and to bookstores either directly from Enzar Empire Press or from Ingram's. Enzar Empire Press has as its mission finding superior fantasy, science fiction, and mystery. This is the second title under the imprint and we think it points the way to exciting new additions to our catalog. Discarding assumptions can open the doors of perception and free the mind. Human civilization was the first on this planet? Maybe not. There were no intelligent dinosaurs? Why not? But if there were, how did they survive in a land of prehistoric monsters? What were they like? Did they wage war? Did they love? Did they pray? What happened to them? Day of the Dragon answers these questions and weaves a spellbinding saga that will sweep the reader along into a fantastic world where dreams come true and nightmares are real. 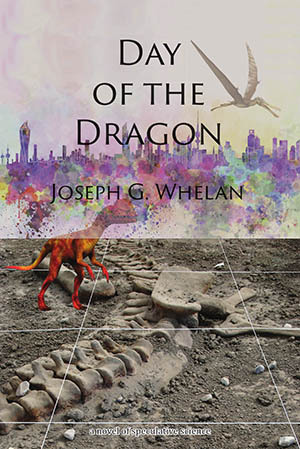 Whether writing about scientists today or creatures that lived millions of years ago, Whelan respects the facts to keep the narrative believable. Just as you can ride shotgun with his fossil-hunters as they drive across America, you can travel back in time to the Age of the Dinosaurs. And when you step out into that primeval world, you will find yourself surrounded by enormous yet strangely familiar beasts. But then you will notice that there is a new creature that you don’t recognize, about as big as you are, and about as smart—or maybe smarter! And before too long you’ll realize that she and her kind have problems that are a lot bigger than yours…. Day of the Dragon (http://direct.energion.co/day-of-the-dragon) is 492 pages, 6” x 9” in perfect bound paperback and retails for $24.99. Ebook editions, without Digital Rights Management are currently available for Kindle and PDF (http://direct.energion.co/day-of-the-dragon-pdf) for just $9.99, and will be available shortly in other ebook formats. Joseph Whelan is an author living in northwest Florida. He is new to the family of Energion Publications and is the first independent writer to be featured in Henry Neufeld’s latest imprint, Enzar Empire Press. Day of the Dragon is Joe's first traditionally published book. Joseph, who usually goes by Joe except when renewing his CPA and driving licenses, has had an interest in writing going back to early childhood when one of his earliest Christmas gifts was a “printing press” that he was told was “just like” the one Gutenberg used hundreds of years before. Half a lifetime later, after Wikipedia allowed parental claims to be easily cross-checked against known facts, the grown-up Joe was a little perturbed to discover that Gutenberg did not actually use oversized Styrofoam™ blocks in his famous system. Between the early printing and the later writing, Joe led a fairly unremarkable life: a college period spent drifting from business to astrophysics; dropping out; moving to Florida; going back to college and discovering that accounting was not the grim wasteland he had been led to believe that it was; obtaining a baccalaureate and then a master’s in accounting; trying and failing to sell magazine articles after college; working as an accountant and then a computer guy at a resort on Panama City Beach for 23 years; and now this writing jazz at Enzar and elsewhere. Before he left the resort, Joe took up the hobby of highpointing, which involves trying to go to the highest natural geographic point in each state. This quest has taken him to all of the states except for Alaska and Hawaii and 45 of the 50 highpoints. So far he has driven 113,901 miles and spent 380 days on the road. You can read about the first expedition here: Ameritrekking and Highpointing: Discovering America the Beautiful [Kindle Edition].